Revelè Violet and Lime Series There are 8 products. Ice-cream and Pastry Shops Wear: discover the Revelé Violet and Lime series of aprons. This wear series dedicated to Ice-cream and Pastry Shops is called Revelé (revealed) because of the pretty effect of the two coordinated colours: the darker shade is followed by a lighter one, creating an overlapping effect that represents the theme of this professional wear series. Two colour combinations proposed: Revelè Violet, in which the darker Violet is matched with the lighter Lilac, and Revelè Lime, with the colour matching of the darker Lime to the lighter Apple. Here are the models available: the Pesaro Apron with bib and Trevi Apron short without bib; the Agnese Pillbox Hat and Sofia Hat, and narrow tie model Seventy. All the garments of the Revelé series are made of Ines Gabardine, a strong poly cotton gabardine (65% pol. 35% cot.) that ensures the brightness of the colours after many washes too. Two-coloured, short apron with bib, unisex, model Pesaro adjustable one sizeLilac and Violet coloursize cm 70 x 65Made of Ines Gabardine, 65% Pol., 35% Cot. Two-coloured, short apron without bib, unisex, model Trevi with big wide pocketLilac and Violet coloursize cm 85 x 35Made of Ines Gabardine, 65% Pol., 35% Cot. Two-coloured, short apron without bib, unisex, model Trevi with big wide pocketApple-Green and Lime coloursize cm 85 x 35Made of Ines Gabardine, 65% Pol., 35% Cot. 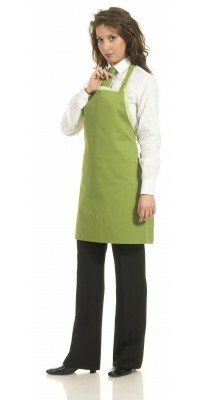 Two-coloured, short apron with bib, unisex, model Pesaro adjustable one sizeApple-Green and Lime coloursize cm 70 x 65Made of Ines Gabardine, 65% Pol., 35% Cot. Two-coloured hat, unisex, model Sofia Lilac and Violet colourAdjustable one sizeMade of Ines Gabardine, 65% Pol., 35% Cot. Narrow tie, model SeventyViolet colourone sizeMade of Ines Gabardine, 65% Pol., 35% Cot. Pillbox hat model AgneseLime colourAdjustable one sizeMade of Ines Gabardine, 65% Pol., 35% Cot. Narrow tie, model SeventyLime colourone sizeMade of Ines Gabardine, 65% Pol., 35% Cot.